HBO has good news for fans of The Wire, the acclaimed TV series about life in inner-city Baltimore that finished its stunning five season run in March of 2008. David Simon, creator of The Wire, has reunited with some of that show’s key contributors to bring us a new series about musicians living in post-Katrina New Orleans. Treme, which takes its name from a neighborhood inhabited by many of the city’s musicians, is set to air in April. Wendell Pierce, who played homicide detective Bunk Moreland on The Wire, will star in the series, though Simon has said that Treme will feature local actors in a variety of roles, as did The Wire. Treme‘s writing and production team will include Eric Overmeyer, a part-time New Orleans resident who worked on The Wire and also on Homicide, Simon’s award-winning series that aired on NBC from 1993-1999. 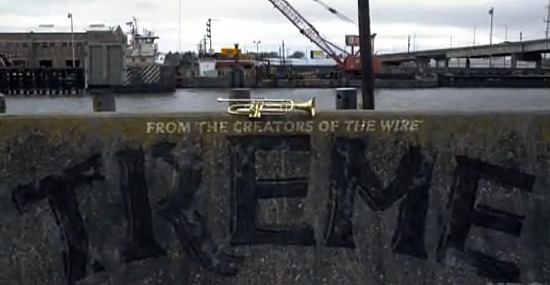 HBO has released a teaser for Treme on its site. Though it isn’t set to Tom Waits’ “Jockey Full of Bourbon”, this scrolling montage of Crescent City scenery recalls the haunting intro of Down By Law, Jim Jarmusch’s 1986 film about three hapless chums snatched off the streets of New Orleans and forced to share a cell in a nearby prison.